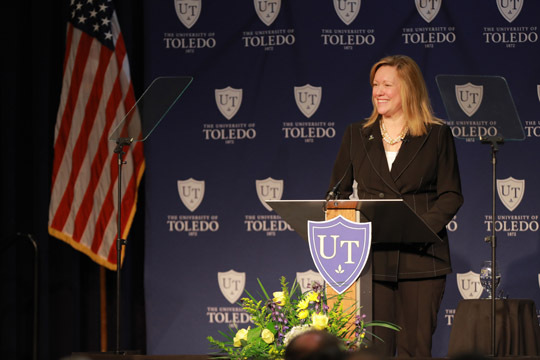 In her second state of the University address, UT President Sharon L. Gaber shared accomplishments that are building a positive momentum on campus and encouraged the Toledo community to uplift its university by showing its Rocket pride. President Sharon L. Gaber addressed more than 400 people who attended her second state of the University address. More than 400 students, faculty, staff and community members attended the speech April 18 in the Thompson Student Union Auditorium. Each attendee received a UT window cling to take with them to share their Rocket pride on their vehicle or in their office or home. Gaber focused much of her talk on the initiatives underway to support student success, enhance research excellence, and strengthen UT’s reputation. The president highlighted a number of programs adopted to support students, such as lowering the cost of a UT education through the Tuition Guarantee program that locks in the cost of tuition and some general fees for four years and a digital course content program that offers less expensive digital texts to students. The $6 million investment in Carlson Library that was completed in the summer has led to a 40 percent increase in student visits this school year, she said, before announcing another enhancement to the library coming in the fall — a new Starbucks on the second floor. Gaber recognized a number of researchers for their contributions to advancing knowledge, including undergraduate physics student Nathan Szymanski, who was recently awarded the prestigious Goldwater Scholarship for his studies of solar cell and battery technologies. Overall, UT’s research program has doubled the number of awards received so far this year compared to the year before. UT has received 233 research awards and nearly $41 million in external research funding, Gaber announced. “We are proud of the national accolades bestowed this year on our talented researchers and faculty members for advancing knowledge,” she said. The president did note that the University has been able to maintain financial stability thanks to a number of successful initiatives last year, but asked every individual at UT to continue efforts to recruit and retain more students because enrollment growth is key to achieving UT’s goals. Building up fundraising efforts also is important for UT’s success. The president publicly announced for the first time how the University plans to use the real estate gift from Welltower, which is UT’s largest gift in history valued at $30 million. UT’s Division of Advancement will relocate to the Welltower property to allow all of its offices — Alumni and Annual Engagement, Development, Special Events, the UT Foundation, and University Marketing and Communications — to work together under one roof. Gaber’s speech about UT’s accomplishments and the talent of its students, faculty and staff led to a call to action for the audience — and the broader Toledo community — to help tell the University’s story and strengthen its reputation by showing their Rocket pride. “UT is this city’s only university. We have an important impact on this community, and we need your support,” Gaber said. “We want you to share our enthusiasm. Mentor our students. See our physicians. Partner with us. Root for our Rockets. And hire our graduates. This entry was posted on Wednesday, April 18th, 2018 at 3:33 pm and is filed under Advancement, Alumni, Library, News, Research, UToday .